From community hospitals to major federal government agencies, this month has already seen a number of notable happenings in the electronic health record space. If the first half is any indication, April is shaping up to be an active month EHR-wise -- and that holds as true among smaller and community hospitals as it does for massive federal government agencies. When Rankin County Hospital District announced that it rolled out an integrated Cerner EHR to support and improve the user experience for both patients and clinicians it marked the most recent move. The hospital, in fact, is the second one this week to opt for Cerner. Kern Medical said it is deploying Cerner’s Millennium electronic health record and the vendor’s population health management tools. New hospital EHR implementations are not limited to Cerner, of course. Last week, for instance, St. Charles Madras Hospital in Oregon said that it just completed a two-year Epic rollout and the Physicians’ Clinic of Iowa subscribed to eClinicalWorks cloud-based EHR services to advance its transition to value-based care. The Illinois Rural Community Care Organization last week also announced that it will implement Cerner’s HealtheIntent population health management platform to more effectively coordinate care across its accountable care organization. A pair of large federal government agencies also made moves this month: The State Department issued an RFI for a new EHR, after it and the U.S. Coast Guard stopped a joint Epic implementation in 2016. The State Department, instead, is now going it alone in picking its next electronic health record while the USCG forged a pact with the Defense Department to implement Cerner under the DoD’s contract. Although Veterans Affairs embarked on its own contract with Cerner, it’s currently on hold since before the departure of former Secretary David Shulkin, MD, so we asked Healthcare IT News readers what they think the VA should do -- and the majority favor VA keeping and modernizing the proprietary VistA EHR. The poll was open to all readers, not just VistA users, it’s worth noting and it started a contentious debate in the comment section below the article. We also posted a new poll asking readers what the State Department should do about its EHR. Weigh in right here. Back in the private sector, Mercy Hospital in Missouri revealed that it built a healthcare cloud to host EHRs, imaging services, and common apps including e-mail and file-sharing for other hospitals that would essentially become Mercy customers. EHR maker Allscripts, for its part, realigned business operations to focus on care coordination and innovation by having the acquired CarePort Health team take over the Allscripts Care Management platform. Vanderbilt University Medical Center introduced V-EVA to the world, too. V-EVA, which stands for Vanderbilt EHR Voice Assistant, uses artificial intelligence and natural language processing technologies to help caregivers better interact with its Epic EHR. 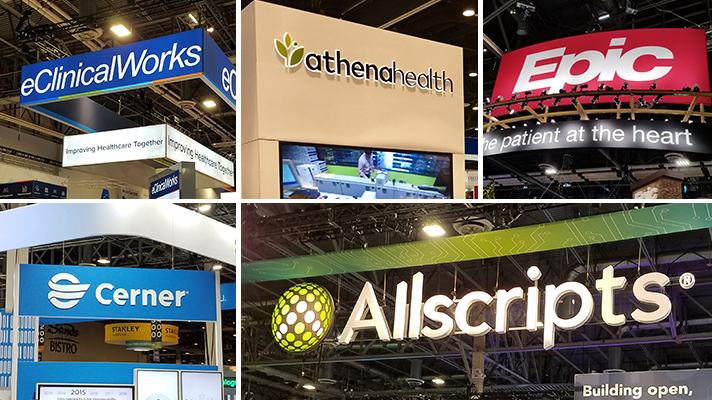 Vanderbilt’s move follows signals that emerged last month at HIMSS18 from EHR vendors Allscripts, athenahealth, Cerner, eClinicalWorks and Epic that they are each working to add AI into the workflow of next-generation software. And late last week ECRI Institute unwrapped the Insight Culture of Safety Assessment for Health IT Companies tool and said EHR and other health IT vendors can use it to track patient safety by enabling them to measure developers perception of safety across department and teams. Whether April’s momentum continues through the second half remains to be seen but this month has been action-packed so far.